So Christmas is over – first time we had it in our house. Sort of nice actually not having crazy amounts of family around. Just the three of us and plenty of snow. Today we are suppose to head south and it looks like the weather is going to allow it. We still have a ton of snow on our block and for several blocks down the hill, but once you get to a main road it is totally clear. Rosie tried to hike out to catch a bus this morning, but ended up coming back and waking us up to drive her. Limited bus runs still, since they need the chains for many of the side road. 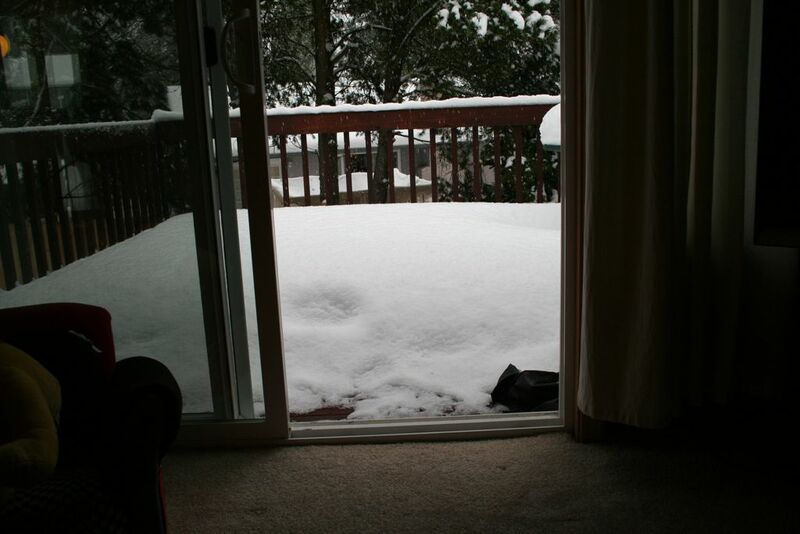 Here a shot of the snow on our deck yesterday, before I started digging it out to cook dinner on the BBQ. As of now the tree is in the backyard, our bags are packed and I was about to go get Isaac some lunch. I just hope this stupid cough will finally go away or it is going to be a long drive. This entry was posted on Friday, December 26th, 2008 at 11:24 AM	and is filed under Uncategorized. You can follow any responses to this entry through the RSS 2.0 feed. Both comments and pings are currently closed.